Ten of our teenagers from the Jacksonville Jewish Center just returned from what I have no doubt was the best week of their lives: USY International Convention in Boston, Massachusetts, the annual convention of our high school youth group, United Synagogue Youth. I know it was the best week of their lives because I still distinctly remember my first International Convention in Chicago and how that was the spark that led me to where I am today as a rabbi. While we were all busy making that “nudge, nudge, wink, wink” inside joke — which isn’t even really an inside joke anymore — about spending December 25th eating Chinese food and catching a movie, they were screaming at the top of their lungs, full of ruach, singing zemirot, Jewish and Hebrew songs, making new friends, and showing so much pride for being Jewish. I asked them, after spending a week with almost a thousand other Jewish teenagers from across North America, what was their favorite part? What stood out the most? Was it the singing? The activities? The discussion groups? The learning sessions? The staying up late? The making new friends? The end of convention dance? The meeting that boy or girl for another region? No. They told me that their most memorable experience was the rally. You see, a thousand teenagers and staff came together, with signs, speeches, and song, in Copley Square, in downtown Boston, to rally against gun violence. Think about it: we were out eating lo mein and seeing Les Mis on the big screen and they were rallying to end gun violence. Not to end guns. Not to ban guns. But to end violence. dedicated his life to ending gun violence. Pastor Brooks, founder of Project HOOD, Helping Others Obtain Destiny, has been walking across America from Times Square in New York City to the Pacific Ocean in Los Angeles to raise awareness of Gun Violence in both urban and suburban areas. Mourning 500th gun-related death in Chicago just this year, Pastor Brooks, a black preacher from inner city Chicago shared his prayer with a thousand Jewish teens from across the continent: “We are all brothers and sisters in creation. What affects me affects you,” he said. “We don’t need to accept gun violence as normal. No other country in the world accepts this as normal. Gun violence isn’t a black issue or white issue. It isn’t a rich issue or a poor issue, it’s a humanitarian issue,” he added. When he shared his prayer to a group of adults, it fell on deaf ears, so instead he shared it with teenagers, with children, whose future is still in front of them, like a blank canvas waiting to be painted. 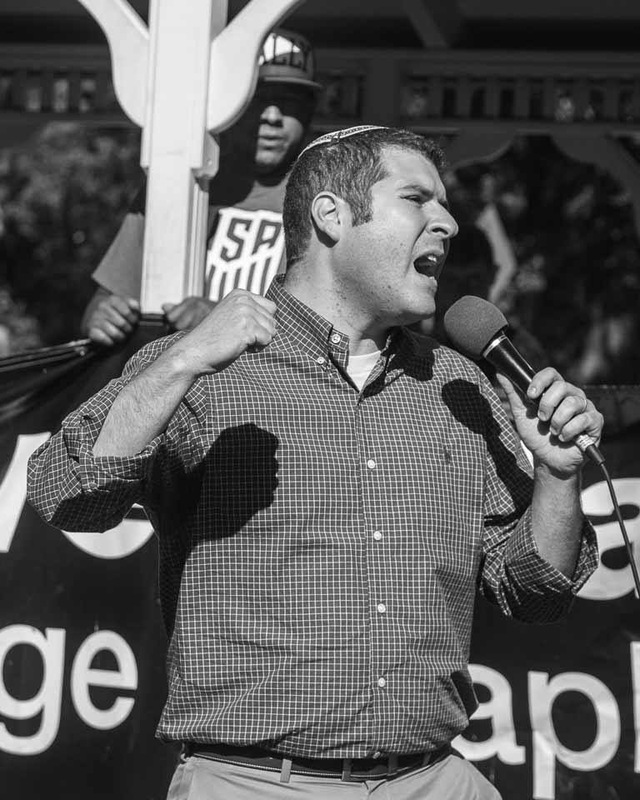 Rabbi Dave Levy, Director of Teen Learning for United Synagogue of Conservative Judaism, and a close friend and colleague shared with the USYers that this isn’t a political issue. It is not political to say enough is enough. It is not political to say that we want to be safe, we want to be freed of the violence. “Making a difference,” he told these teenagers “is more than just pressing ‘like’ on a Facebook post or retweeting someone else’s 140 character tweet.” He encouraged the future of the American Jewish community to hold unto the teachings of Rabbi Abraham Joshua Heschel, of blessed memory. Last week was the 40th yahrtzeit of Rabbi Heschel, the great scholar, theologian, and social activist. Reflecting on his march for civil rights from Selma to Montgomery, arm and arm with Dr. Reverend Martin Luther King Jr., he prayed with his feet. That is what these 900 USYers were doing.They did not necessarily have policy answers or solutions. What they did have was a vision for a peaceful future. As parents, we want to keep our children safe, but we acknowledge that this is impossible. We know that we cannot watch over them all the time. We cannot protect them all the time. So we turn to God and ask God to protect them, we ask God to watch over them. We say this every Shabbat: May God bless our sons like Ephraim and Menashe and our daughters like Sarah, Rebecca, Rachel, and Leah. May God bless them and keep them safe. HaElohim asher Hithalchu avotay lefanav Avraham v’Yitzhak, HaElohim Haro’eh Oti me’odi at Hayom Hazeh, Hamalakh HaGoel Oti mikol rah yevarech et hane’arim. May the God in whose ways my forefathers Abraham and Isaac walked, May the God who has been my shephard from my birth until this very day, May the angel who has redeemed me from all evil and harm, bless these teenagers. Jacob offers this blessing, knowing that ultimately Ephraim and Menashe are responsible for the blessings in their own lives. Their actions lead to blessings and ultimately bring blessings in Jacob’s and Joseph’s lives as well. We always think we know what is best for our children and that is why we want to protect them. Thus, it is quite humbling when our children teach us life lessons and teach us about what is important. It is quite powerful when our children teach us how to pray with our feet. I know we have though a lot about the tragedy of Newtown, Connecticut in recent weeks. As individuals, we tend to have kneejerk reactions. It takes a terrible tragedy to remove the blinders from our eyes and tell us that something is not right. Then, another tragedy occurs and we forget about the previous one. What amazed me about this rally against gun violence was that this had nothing to do with Newtown, Connecticut or Aurora, Colorado or Portland, Oregon, or Oak Creek, Wisconsin. Yet, it had everything to do with these places. This rally was not a kneejerk reaction. Planned many months ago, it was teenagers deciding that enough was enough and they wanted to take a stand. It seems that our children have a lot to teach us. Maybe we are consumed by darkness. Maybe we have become the pessimists who do not believe that the world can improve, who accept this as reality and do not believe the world can change. Thank God for our children who encourage us to believe that a better future is possible, who want to paint their blank canvases of the future with sunshine and rainbows in stand of darkness and bloodshed. Some may say that it is just a rally, just an event. With little direction, no pressure to make any legislative changes, all it was was a show, a simple act; a small group participating in a small event. I disagree. For it was Margaret Mead, the American Cultural Anthropologist of the last century that said: “Never doubt that a small group of thoughtful, committed citizens can change the world. It is the only thing that ever has.” So let this rally be a rallying cry, a charge, and a lesson to us all. Thank you to our children, both young and old, for blessing us, for inspiring us to change the world. This past Shabbat, as we ended the book of Genesis, we recited the words Hazak Hazak, v’Nitzhazek, through strength, strength, may we be strengthened. We say these words, to link the narrative of one book of Torah to the next. However, these words speak to the power, strength, and courage of community. we recite the Hebrew word for strength, Hazak, twice. Alone, we have no strength. Alone we are powerless, we are silenced. But together, as community, we are truly strengthened with the strength to make a difference. So let us go from strength to strength and let us all have the strength and courage to no longer remain silent. Let us bless our children with a better future by learning from the blessings that we have been taught by our USYers this past week. As we begin the secular year of 2013, may we also go from strength to strength and have the strength to stand up and pray with our feet. Hamalakh HaGoel Oti mikol rah yevarech et hane’arim. May the Angel that protects all of us from harm, bless these teens, bless all of our children, and bless all of us. Amen. The Sabbath is meant to be a day of rest, a day of peace. That is why in Hebrew we say Shabbat Shalom. Yet, following the terrible mass shooting tragedy at Sandy Hook Elementary School in Newtown, Connecticut on Friday that left twenty young children murdered in cold blood, this past Shabbat was emotionally draining for so many of us. Many asked, “Where is God?” This is a question that we often ask at times of tragedy, inexplicable moments of darkness. The answer: God is here, with us. As we watch the news and wail, as our tears drip into puddles on the front page, God is also crying. God is right by our side, in horror, in shock, in disbelief, crying. In Isaiah 22:4 God cries out: “Turn away from me and let me weep bitterly. Don’t try to comfort me, for the destruction of my people.” God cries. The Omnipotent does not try and intervene. Rather, after giving us, God’s children made in God’s image, the blessing of responsibility, God cries. The mournful book of Lamentations tells of the tragedy of the destruction of the Temple in Jerusalem. In the midrash, Lamentations Rabbah, God cries out. Trying to comprehend that violence and hate that destroyed a symbol of peace and unity, God bemoans: “Woe is Me for My house, My children – where are you? My priests, where are you? Those who love Me, where are you?” God cries with us. God feels helpless, just as we do. As parents, some of us just wanted to curl up in a ball, hide the news from our children, and protect them from the darkness of this world. Our hearts broke upon hearing the name of each child, so young, so innocent, like our matriarch Sarah, who, according to tradition, died of a broken heart, after she thought that her one and only child was no longer living. Others among us refuse to accept this as reality, waiting to wake up from this nightmare. In the immediate aftermath of this tragedy, many parents suggested that we should simply go home, pray, and hug our children. This is what I did. This is what I always do at the end of the day. I squeeze my daughter tight and beg God to protect her. Then I ask, “what can I do to protect her?” That is when I remember that I cannot hug her all the time. I cannot permanently shield her from harm’s way. I must take responsibility to make this world a better place, a safer place, for her. Are we prepared to take responsibility? Are we prepared to take action and to prevent such acts from happening ever again? The Jewish Council on Public Affairs is currently circulating a petition online urging the President and Congress to directly confront gun violence. The Rabbinical Assembly and the United Synagogue of Conservative Judaism expressed the need for restrictions on gun ownership in a joint press release. In a week, close to one thousand Jewish teenagers will gather for the annual United Synagogue Youth (USY) International Convention. As part of this program, the teens will be having a Rally Against Gun Violence. All are examples of taking action. We must not sit idly by and watch God’s children destroy each other. The late Rabbi Abraham Joshua Heschel, a leader in social justice, taught “Above all, the prophets remind us of the moral state of a people: Few are guilty, but all are responsible.” There have been calls for increased awareness and assistance for those suffering from mental illness. This is necessary. However, so is stricter gun control. I am responsible. You are responsible. We are responsible. Some focus on the second amendment, the right to bear arms. This right is supposed to ensure our safety. Such a right has only caused more danger in our society. There have been fourteen mass shootings in this past year alone. Stricter laws as well as an increase in mental healthcare will help prevent lethal weapons from legally ending up in the hands of those who should not be carrying them. Our children’s right to a future full of opportunity takes precedent over our right to bear arms. We are responsible. We must wipe away our tears and make a change so that God too can stop crying. Rabbi Heschel also noted, reflecting on his march for civil rights from Selma to Montgomery, that “legs are not lips and walking is not kneeling. And yet our legs uttered songs. Even without words, our march was worship. I felt my legs were praying.” Let us take action. Let us pray with our feet. Until this moment of change takes place, I continue to pray to the Holy One, asking God to protect all of our children. Quoting the words of the Priestly Benediction, traditionally said by parents to their children on Sabbath eve: “May God bless you and protect you. May God’s face radiate upon you and be gracious unto you. May God lift up God’s face unto you and grant you peace.” And May we, made in the Divine image, help ensure such blessing, such protection, such grace, and such peace through our actions. We are God’s messengers. When we act, God acts. When we sit around in disbelief and refuse to do nothing, God cries. May we mourn all those lives lost in Newtown and may their memories be for a blessing. We all Dream, but are we Dreamers? I was tossing and turning in my sleep the other night, as I regularly do. My wife, lovingly hit me in the ribs and told me to stop. When I woke up the following morning, she asked why I had trouble sleeping. I explained that I slept fine and I was tossing and turning because I was part of a top secret black ops mission fighting terrorists. I few nights before that, I was a pirate, sailing the seven seas. Sometimes, I dream that I am living in a post-apocalyptic future. These dreams probably have less to do with my thoughts and more to do with the television shows I watch or book that I read before bed. Regardless of the reason for these dreams, I know how silly and strange they are. They make no sense. Yet, it isn’t until I wake up in the morning that I realize that it was only a dream. Often, days later, I begin to wonder if an experience actually happened or if it was just another crazy dream of mine. I have no doubt that the same is true for so many. We all dream, but how many of us are dreamers? I am not referring to those of us who close our eyes and enter into a fantasy world. Rather, I am referring to those of us who, while awake, while living our lives, while sitting right here, dream of and envision a better and brighter world. Those are the dreamers among us. But how many of us keep these dreams to ourselves or fight to make them a reality? Most of us keep quiet. We have seen history. We know what happens to dreamers. President Abraham Lincoln made it his mission as president to reunite a country divided in a bloody civil war and to abolish the greatest disgrace of this country: slavery. Although the thirteenth amendment abolishing slavery was passed, Lincoln was assassinated by confederate spy John Wilkes Booth who disagreed with Lincoln’s efforts to grant equal rights to all. Mahatma Gandhi was the leader of Indian Nationalism in then British-ruled India in the early 20th century. Using non-violent civil disobedience to have his dream of an independent India, without a caste system realized, he used hunger strikes as a means to make his dream a reality. He was assassinated in 1948 by a Hindu Nationalist who believed Gandhi had weakened India. The Reverend Martin Luther King Jr. shared his dream for civil rights, delivering his “I Have a Dream” speech during the March on Washington in 1963. Five years later, he was assassinated in Memphis, Tennessee because many didn’t want his dream realized. Israeli Prime Minister Yitzhak Rabin was awarded the Nobel Peace Prize for his efforts, along with Foreign Minister Shimon Peres and Yasser Arafat, to bring peace to the Middle East. On November 4, 1995 while at a peace rally, Rabin was assassinated by Yigal Amir, a right-wing Israeli extremist who was not interested in peace, who wanted to squash Rabin’s dream. It often seems that the voice of the dreamer is never loud enough. Or finally, when it gets loud, it is silenced by the bullet, silenced by those who disagree. The end of the book of Genesis, beginning with the Torah portion Parashat Vayeshev, introduces us to the narrative of Joseph and his brothers. Jacob’s other sons were already jealous of Joseph, believing that he was their fathers favorite child. When Joseph shared his dream with his brothers, this surely didn’t help matters. He dreamt that he would rule over his brothers, as the sheaf that stood upright while all other sheaves bowed down, with the sun and moon and stars bowing down to him as well. We tend to think that this is a selfish dream, a dream in which Joseph suggests he is better than his brothers, and that this is his way of sticking it to them. In the ancient near east, dreams weren’t a way of living in another world as a black ops navy seal or a pirate like I sometimes do. Dreams were an avenue of Divine communication. Joseph believed that his dreams were God’s will, and his dream to lead, his vision for a brighter and better future was as well. Joseph’s dream was that he would lead. It was his way of believing that he could do good and bring about good. We learn ultimately that despite the events of the parasha when he is thrown into a pit and almost killed, sold into slavery, and ultimately thrown in prison, nothing can stop him from achieving his goals. He believed that his leadership would help others and it does. This is not a selfish dream. Dreamers aren’t selfish. They sacrifice their own well-being for the betterment of others. In some cases, like those mentioned above, they sacrifice their lives. Joseph’s dream is supposed to remind us of our own dreams, our own visions for a better and brighter future. Throughout the Festival of Hanukkah, we light the Hanukkiyah, the special Hanukkah Menorah. Using the shamash, the helper candle, we light the flames of the Hanukkiyah and ignite the spark within us. The way the calendar falls, we always read the story of Joseph right around Hanukkah. This is no accident. The story of dreamers, of believing that through our own action a bright and better future is possible, goes hand-in-hand with the festival that celebrates miracles. Unlike the Shabbat candles which we can use to help us see at the dark hour, we are taught that after lighting the Menorah, we cannot use the light of the candles. Instead, we place the Menorah in the window of our homes or outside the door for all who pass by to see. The Talmud teaches that we light the Menorah for the sake of pirsumei nisa, spreading the miracle, spreading the word of God’s great miracles, sharing these miracles with others. The light of the Hanukkiyah is a hope for a better future, a reminder that as dark as the night is, we cannot let the light go out. Sometimes, it takes each of us spreading that light, spreading the miracle, to help reignite the spark within others. Spreading the light of Hanukkah is spreading our dreams and our visions. It is said that “in the darkest hour the soul is replenished and given strength to continue and endure.” So too, during the darkness of winter, at a time when we’ve awakened, given up on our dreams, the light of the Hanukkiyah replenishes our soul, allows us to dream again, to believe again. When we dream, we believe. When we dream, we have faith. To give up on our dreams, is to lack faith, is to be empowered by fear, is to be too afraid to speak up and share our dream with the world. I am a dreamer. I dream of a better future, a better world than this. I dream of a world in which there is peace, a world in which we can live side-by-side with our neighbors, a world in which we are able to refer to those of different religions, races, and ethnicities as our brothers and sisters. I dream of a world in which we treat each other with the respect that as God’s children, made in God’s image, we each deserve, and I dream of a world in which we refuse to stand idly by and witness the injustices of poverty, of war, of bigotry, of hate. I am not afraid to share my dreams with you. I know that I alone cannot make these dreams a reality. I am just a dreamer, and like Joseph, maybe naïve to think that sharing my dreams with others will make a difference. Still, I share my dream hoping that it will become the dream of many, knowing that there are those in this world, maybe those in my own community, that disagree. Joseph was aware that he may anger his brothers. That did not silence him. That did not silence his belief that he could do good and help others. So, I invite all of you to be dreamers. I invite all of you to dream of a better and brighter future; and I ask all of you to not remain silent. When we light the Menorah, we add a candle each and every night so that at the end of Hanukkah, we have a full candelabra with all candles lit. Rabbi Hillel suggested that we increase the amount of light each night because we must be ma’alin bakodesh, we must be elevated in holiness and sanctity. If we were to begin with eight candles and light one fewer each night, then we would be decreasing the amount of kedushah, of holiness in the moment and experience. So we are ma’alin bakodesh, and in doing so, we are further spreading the miracle of Hanukkah, the miracle of God, the miracle of action. It is easy to feel hopeless. It is easy to give up. It is easy to feel like our dreams are out of our reach, but the more we share these dreams, the more they too become elevated in holiness, the more they too become reality. So let us dream like Joseph and act like the Maccabees. Let us be a people of thought and a people of action. Let us create a nes gadol, a great miracle, in all of our lives. It has now been weeks since the 2012 United States Presidential Election and going into election night, one thing was clear, regardless of who would prevail: we are a divided nation. Almost three billiondollars were spent on this election with both the Republicans and Democrats trying to sell their candidates and paint the opposition in a negative light. Leading up to election night, it was clear that the country was relatively split. During this time of year, we remember such division and the threat that it causes to a nation and a people. The miracle of Hanukkah is not the story that we teach our children that we only had one day’s worth of oil to light the menorah and somehow, that oil miraculously lasted for eight days. Historians teach that the miracle is that we won, that the Jewish people were victorious against King Antiochus and the Greeks. The battle between the Jewish Rebels, the Maccabees, and the Greeks was a David versus Goliath battle, but it was also a civil war. More so than a small group of Jewish rebels versus an expansive Greek army, this was one group of the Jewish community in battle against another. This was a civil war between the small sect of traditionalist Jews and the larger Hellinized Jews whom had become acculturated in Greek society and joined the Greeks in battle. This was a war between a divided population of the same people with opposing beliefs, practices, and viewpoints that refused to respectfully talk out their differences. This was a war between brothers and sisters who refused to sit down at the same table with each other. I believe that the miracle wasn’t even the Maccabean victory. Rather, the miracle was that following the victory, the Jewish people were able to become one again. Following physical and verbal warfare, schisms in homes and families, the Jewish people were able to reunite. The rededication of the Temple that we celebrate during Hanukkah was a rededication of the Jewish community – an appreciation of the ethics and values of our tradition and an acceptance that what unites us as a people is far greater than what divides us. The true miracle that we celebrate then at Hanukkah is the miracle of unity. Leading up to the November presidential elections, it was clear that there were two different views for the future of this country. These two opposing views between politicians, pundits, and supporters have led to, in this aftermath of the election, a split nation and community. Such a division of belief and practice in the Jewish community ultimately led to the civil war remembered during the holiday of Hanukkah. As a people, we are troubled by the reality of Hanukkah – brother killing brother – so we mask this in legendary tales of miraculous oil. We cannot fathom such division so we focus on the sliver of light that existed at the end of a dark tunnel in Jewish history – the reunification of the community following such a split. My hope and my prayer is that we too as a nation, rooted in the same ethics and morals of our tradition, will see such a sliver of light and leave the dark and bitter differences of our past behind us. Continued partisan politics, refusing to hear the voice and opinion of another, accomplishes nothing. Working together in a bipartisan effort, allows us to make this world a better place and do true tikkun olam. Let the flickering flames of the Hanukkah menorah create a spark inside us as a nation so that the miracle of unity that we remember on this festival will lead us to become united once again as a people, as a community, and as a nation.